Immediate implant: An approach for better esthetics!!! Dental implants can be placed in fresh sockets just after tooth extraction. These are called "immediate implants." The intention of placing immediate implants is to try to preserve tissue contour, dimension, and also decrease treatment time. The soft and hard tissue changes following tooth extraction are in close relationship to the timing of the implant placement. In spite of similar success rates reported for immediate, early, and delayed placement, it is very important to understand the risk factors related to each procedure, to have careful case selection, and to closely follow the surgical and prosthetic protocols. The paper describes a case of 29-year-old male with right maxillary lateral incisor root stump, treated with extraction of the root stump followed by immediate implant placement. Tooth loss can adversely affect an individual's life. It has been found to have an emotional impact affecting one's self-confidence, food habits, esthetics, function, and personal and social life. The dentist's primary goal in such situations should be to restore the patient to normal esthetics, function, speech, and overall health. Missing teeth and supporting oral tissues have traditionally been replaced with dentures or bridges permitting restoration of chewing function, speech, and esthetics. Dental implants offer an alternative. These implants are inserted into the jawbones to support a dental prosthesis and are retained because of the intimacy of bone growth onto their surface. This direct structural and functional connection between living bone and implant surface, termed osseointegration, was first described by Brånemark et al. and has undoubtedly been one of the most significant scientific breakthroughs in dentistry over the past 30 years. Teeth may have been lost through dental disease or trauma, or they may be congenitally absent. However, in many clinical situations, compromised teeth or roots may still be present in the patient's mouth. Traditionally, before placing dental implants, compromised teeth were removed, and the extraction sockets were left to heal for several months. However, the great majority of patients are interested in shortening the treatment time between tooth extraction and implant placement or even better in having the implants inserted during the same session as the teeth are extracted (immediate implants). This would result in interventions for replacing missing teeth: dental implants in fresh extraction sockets. 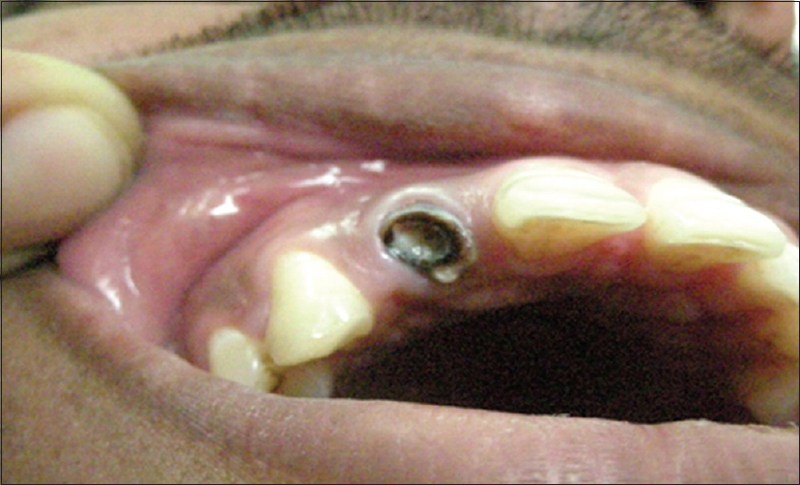 A 29-year-old male reported in the Department of Oral Diagnosis and Radiology with the chief complaint of root stump in the upper right front region and gave a history of trauma due to accidental fall on floor during badminton game 2 years back, in which he had fractured maxillary left lateral incisor and the patient went for root canal treatment but left it incomplete due to negligence and slowly tooth crown was worn out [Figure 1]. He was referred to the Department of Periodontics and Implantology for needful. The patient's general and medical history was taken and was found nonsignificant. The patient was examined clinically and orthopantomograph was taken [Figure 2]. After clinical and radiographic examination, it was evaluated that there was no underlying pathology and tooth root was unrestorable but was surrounded by healthy bone. Atraumatic extraction of the root stump followed by immediate placement of implant was planned. The patient was informed about the treatment and consent of the patient was taken. Consent for taking photographs of the patient was taken too. Root stump was extracted atraumatically under local anesthesia after carefully raising the flap [Figure 3] and [Figure 4]. The pilot drill (D-2.0 mm) was used for creating an osteotomy site of the appropriate depth, i.e., 10 mm for implant placement (Osstem implant system) [Figure 5]. It is indexed with various markings corresponding to the desired implant lengths. When appropriate depth was reached with the pilot drill, the implant depth probe was used for tactile perception of intact bony plates, any perforation, and the confirmation of desired osteotomy depth. Once desired depth was confirmed, paralleling pins were placed to check the proper alignment of the implant with adjacent teeth and opposing occlusion. After confirmation of depth and angulation, the osteotomy site was prepared by a series of gradually larger drills to the requisite width with a speed of 1400-1500 rpm at 1:16 reduction torque as per manufacturer instructions. The implant site was generously irrigated with sterile saline to remove any residual bone chips/other residue following preparation. The depth of the osteotomy site was ascertained with implant depth probe. The implant was removed from the sterile vial using the insertion tool and delivered directly into the osteotomy site. Contamination by touching the implant with instruments made of a dissimilar metal or by contact with soft tissue, cloth, or even surgical gloves may affect the degree of osseointegration. The implant was then pressed into the prepared site with 35 N torque with the mount on handpiece and finally aided by the insertion mount. Thus, implant placement was done with insertion tool attached to the implant head with handpiece mechanically and finally with torque controlled ratchet [Figure 6] manually to snugly fit the implant. The implant was never forced into the socket with excessive force as this might lead to microcracks in the surface bone resulting in improper osseointegration. Implant that was placed was checked for stability by applying gentle pressure to determine if it could be depressed or rotated. Furthermore, primary implant stability was assessed with the torque-controlled ratchet. The cover screw, provided with the implant package, was then placed using the hex-driver using finger pressure. At this point, the implant was confirmed to be immobile, which reaffirmed primary implant stability. The flap margins were then repositioned and sutured tension-free using 3-0 silk reverse in interrupted fashion [Figure 7]. An intraoral periapical radiograph was taken postoperatively to evaluate the implant angulation and position [Figure 8]. The patient was on regular recall and under strict oral hygiene measures. After 12 weeks, the radiograph was taken [Figure 9], and prosthetic phase was carried out under the opinion and supervision of a prosthodontist. After soft-tissue healing, impressions were made with the impression postattached to the implant using the closed-tray impression technique. Shade selection was also done during this appointment. Casts with impression, postimplant analog complex, abutment, lab drivers, and selected shade were sent to laboratory for preparation of cement-retained porcelain fused to metal (PFM) crown. Healing abutment/gingival former was replaced until the time taken for laboratory manufacture of the prosthesis. After approximately 4-7 days, the healing abutments were removed and replaced with the final abutment. The PFM crown was checked for its passive fitting to abutment and noninterference with adjacent teeth. Crown was then cemented with glass ionomer cement (GC Fuji-I) [Figure 10]. The patient was given oral hygiene instructions, and periodic recall was maintained. Atraumatic extraction is essential while placing an immediate implant. Attempting this is recommended to provide the best healing conditions for the socket. Despite all efforts, trauma to the bundle bone of the socket cannot be avoided since extracting a tooth implies severing the collagen fibers and blood vessels of the periodontal ligament. There are several techniques described to carry out an extraction atraumatically. Blus and Szmukler-Moncler state that with piezosurgery, extractions are less traumatic than with forceps, especially in carious teeth or brittle roots. Cosyn et al. perform their atraumatic extractions with periotomes with minimal mucoperiosteal flap. Extracting a tooth, with or without elevating a flap, is a surgical aspect that must be considered. Covani et al. affirm that elevating a flap may cause alveolar bone resorption in the exposed area, whereas a flapless technique reduces patient discomfort, alveolar crest dimensional alterations, and better quality of the soft tissue around postextraction sites. This reduces surgical trauma and preserves the integrity of the vascular supply because the periosteum is maintained. Once the tooth is extracted, the stages of alveolar healing initiate. There are diverse numbers of proposed classifications of sockets after tooth extractions. Many of these can aid the clinician in the decision-making process to determine if their case is favorable for immediate implant placement or not. The proposed five keys to consider are important to take into account before tooth extraction and what considerations to have during and after implant placement. This can guide the clinician to choose favorable cases and avoid complications. There are five key aspects to consider during the decision-making process, to help prevent blunders that can lead to difficult esthetic situations. The following are: (1) the presence of a buccal plate, (2) primary stability, (3) implant design, (4) filling of the gap between the buccal plate and the implant, and (5) tissue biotype. The buccal bone is a critical aspect, and the first triangle, one has to take into account, to prevent esthetic complications. Grunder et al. suggest that the presence of a 2 mm buccal plate is crucial to avoid soft tissue recession, and an interimplant distance of 3 mm should always be present to allow papilla formation. If the case requires installing an implant adjacent to a tooth, they state that a distance of 1.5 mm should be maintained to preserve bone tissue and fiber attachment and, therefore, the loss of the interproximal papilla. Choquet et al. state that papilla level is mostly related to the bone level adjacent to teeth and more specifically to the bone crest. They determine that when a distance of 5 mm or less between the contact point to the bony crest exists, the regeneration of papillae will be accomplished. Furthermore, palatally placed implants provide more space to allow for the growth of horizontal soft tissue that can later be manipulated to create a more adequate soft-tissue profile. Moreover, when there is a lack of mesiodistal space, Vela et al. study the concept of platform switching; a discrepancy between the diameter of the implant platform and the abutment. They were able to determine that these implants can be as close as 1 mm to teeth and still maintain the interproximal bone peak. On the other hand, there is a minimum distance that implants should be separated to maintain a bone peak. With the use of the platform switching, implants can be placed as close as 1.5-3 mm to each other and still obtain a greater coronal bone-to-implant contact, thus preserving the interproximal bone peak. Placing an immediate implant is a delicate procedure, which requires not only the presence of the buccal plate but also of sufficient bone apical to the extracted tooth's alveolus. An approximate 2-4 mm of bone apical to the alveolus is necessary to have a greater possibility of obtaining a stable anchor and thus obtain stability. This can be enhanced by the type of implant used, which is of a tapered design. Different implant designs influence the biomechanics of the environment where an immediate implant is placed. As mentioned before, achieving primary stability at implant placement is essential when planning an immediate load technique. To enhance primary stability, self-tapping implants were developed, which compress the alveolar bone as the implant is inserted. Therefore, the overall design of an implant is ideally one that ensures good primary stability even when placed into the bone of reduced quality and quantity. After an extraction, it has been postulated that there is a horizontal resorption of bone dimension that amounts to 56%. Furthermore, when an implant is inserted immediately after a full-thickness flap extraction, there will be a void created between the buccal wall and the implant. The mentioned space, is suggested to be filled with a biomaterial for many reasons described by Araújo et al. They state that filling the gap with deproteinized bone mineral has beneficial outcomes: (i) hard tissue healing process is modified, (ii) additional hard tissue is present at the reentrance of the socket after a period of bone healing, (iii) soft tissue recession is prevented, and there is an (iv) improvement of the marginal bone-to-implant contact. Therefore, the placement of xenogenic material in the void between the buccal wall and the implant surface compensates for the hard tissue lost after a tooth is extracted. A preoperative cone-beam computed tomography can be very helpful in terms of measuring the buccal plate and can provide more information before the extraction of the tooth. Thus, this is done to maintain hard-tissue contour, but preserving the volume in soft tissue is also of crucial importance, especially in the esthetic zone. This is the fifth triangle, biotype. Kois et al. analyzed five factors that influence peri-implant esthetics. They stated before tooth extraction, it is important to predict the complexity of the case by considering the initial tooth position in the three planes of space. The type of periodontium can provide the clinician with useful information to determine the intricacy of the case. The presence of a highly scalloped gingiva translates into a larger discrepancy between facial and interproximal bone leading to an increased risk of recession. Furthermore, the patient's biotype is also of crucial importance, being more favorable, if it is thick rather than thin. Of equal significance is the location of interproximal bone before extraction, which will prevent the loss of the interproximal osseous position and, thus, the overall soft tissue architecture. Immediate implants require a complicated and precise soft-tissue management. Moreover, De Rouck et al. demonstrate that using single immediate implants with instant provisionalization, can help optimize esthetics. It was concluded that this could limit the amount of midfacial soft tissue loss, being this area the most critical in esthetic implant dentistry. Nevertheless, if primary stability is not achieved, or the patient's case does not fit the ideal requirements for immediate provisionalization, this should not be done, and therefore, a different type of treatment should be considered. Our data show a survival rate of immediate implantation carried out on this patient at 1 year after immediate implantation and does not differ from the cases in which implant was placed in healed sites. These data agree with those from other authors who evaluated the clinical success rate of immediate implantation without the use of any membrane or graft material in both humans and animals. It must be kept in mind that the present study is related to immediate implant, not subjected to functional loading, and therefore, not fully comparable with the results from loaded implants. However, it has been demonstrated that functional loading does not impair but rather enhances bone maturation. Thus, implant dentistry enables the restoration of nearly every clinical situation ranging from partially to totally edentulous patients with greater success and predictability. With all the advancements that have been made so far in the field of implantology, the goal still remains to further simplify the existing procedures, reduce the time duration of implant therapy for both the patient and the clinician, make the treatment cost-effective, and improvise the success rate. Efforts to achieve this goal along with a thorough training of the dental professionals to perform as a team and long-term maintenance by the patients surely makes implants the future of dentistry. Following the five diagnostic keys, (1) the presence of a buccal plate, (2) primary stability, (3) implant design, (4) filling of the gap between the buccal plate and the implant, and (5) tissue biotype, can help reach a more precise diagnosis and case selection to obtain optimum results. Implant design is recommended to be self-tapered, so it can favor reaching primary stability. Divya K, Sivaram G, Kumar TS. Awareness is the key to acceptance of implant therapy. Indian J Oral Sci 2016;7:24-7. Lindeboom JA, Tjiook Y, Kroon FH. Immediate placement of implants in periapical infected sites: A prospective randomized study in 50 patients. Oral Surg Oral Med Oral Pathol Oral Radiol Endod 2006;101:705-10. Brånemark PI, Hansson BO, Adell R, Breine U, Lindström J, Hallén O, et al. Osseointegrated implants in the treatment of the edentulous jaw. Experience from a 10-year period. Scand J Plast Reconstr Surg Suppl 1977;16:1-132. Fugazzotto PA. Treatment options following single-rooted tooth removal: A literature review and proposed hierarchy of treatment selection. J Periodontol 2005;76:821-31. Gomez-Roman G, Schulte W, d′Hoedt B, Axman-Krcmar D. The Frialit-2 implant system: Five-year clinical experience in single-tooth and immediately postextraction applications. Int J Oral Maxillofac Implants 1997;12:299-309. Yukna RA. Clinical comparison of hydroxyapatite-coated titanium dental implants placed in fresh extraction sockets and healed sites. J Periodontol 1991;62:468-72. Paolantonio M, Dolci M, Scarano A, d′Archivio D, di Placido G, Tumini V, et al. Immediate implantation in fresh extraction sockets. A controlled clinical and histological study in man. J Periodontol 2001;72:1560-71. Blus C, Szmukler-Moncler S. Atraumatic tooth extraction and immediate implant placement with Piezosurgery: Evaluation of 40 sites after at least 1 year of loading. Int J Periodontics Restorative Dent 2010;30:355-63. Cosyn J, Sabzevar MM, De Bruyn H. Predictors of inter-proximal and midfacial recession following single implant treatment in the anterior maxilla: A multivariate analysis. J Clin Periodontol 2012;39:895-903. Covani U, Cornelini R, Barone A. Buccal bone augmentation around immediate implants with and without flap elevation: A modified approach. Int J Oral Maxillofac Implants 2008;23:841-6. García J, Sanguino D. A new protocol for immediate implants. The rule of the 5 triangles: A case report. Clin Oral Implants Res 2014;21:4-5. Schwartz-Arad D, Chaushu G. The ways and wherefores of immediate placement of implants into fresh extraction sites: A literature review. J Periodontol 1997;68:915-23. Esposito M, Grusovin MG, Polyzos IP, Felice P, Worthington HV. Timing of implant placement after tooth extraction: Immediate, immediate-delayed or delayed implants? A Cochrane systematic review. Eur J Oral Implantol 2010;3:189-205. Prasad DK, Mehra D, Prasad DA. Recent advances, current concepts and future trends in oral implantology. Indian J Oral Sci 2014;5:55-62.